The Verizon-bound Motorola Droid Turbo 2 is the new kid on the phone block and it hides an ace up its sleeve: the promise for two full days of battery life and a display unlike any other. While others focus on a sleek, thin profile, the Droid Tubo 2 puts battery on the top spot of its priorities and trades this for a bit of added girth. For all else, it's out there with the best phones that you can buy right now: it sports Qualcomm's top of the line Snapdragon 810 system chip, promising camera and plentiful internal storage. In the slideshow below, we try to tell you about its 15 most important new features that make it stand out among all the others. 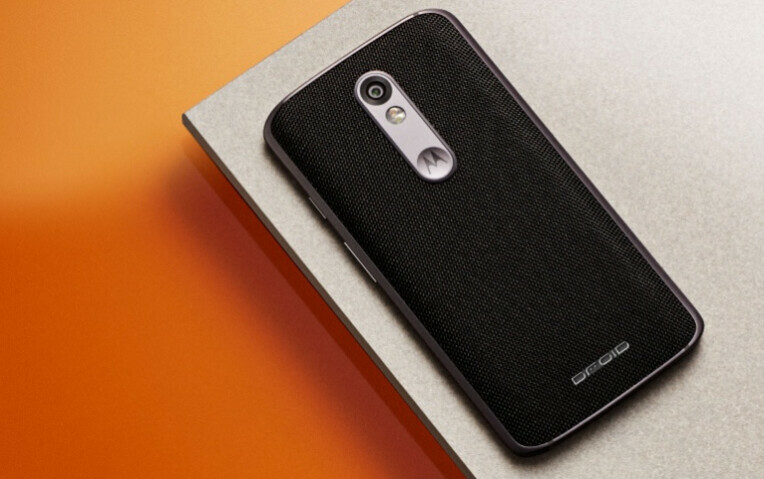 Take a look and let us know: how do you like the new Droid Turbo 2? Motorola is actually using five whole layers for the display stack to ensure that accidental drops won't result in a shattered display. The first layer of ShatterShield is a rigid, aluminum core that serves as the foundation of the integrated system, melded together with layer number two: a flexible AMOLED display that will bend instead of shatter upon impact. These two are then joined by what Motorola calls a Dual Layer touchscreen with 'redundancy' (to absorb shock), and an interior and exterior lens covers, the latter of which will supposedly prevent dents and scratches. Motorola is consistently bringing phones with great battery life and the Droid Turbo 2 is no exception: with its massive, 3760mAh battery, the phone is officially announced to last two full days between charges and that's a great thing for everyone who's not working in an office from 9 to 5. Qualcomm's top-end system chip with an 2.0 GHz octa-core setup and Adreno 430 GPU running at 600MHz, also comes with a Natural Language Processor and Contextual Computing Processor, two of the features that allow for the signature wave gestures and always-on voice features on Motorola phones. Having great battery alone is good, but not enough: usually whne those large batteries drop dead, they require lengthy times to recharge back to full capacity. Luckily, the Droid Turbo 2 comes with quick charging that allows it to get 13 hours of talk time in 15 minutes of charging. A phone with a big screen does not have to be huge in terms of dimensions: phone makers often pair larger panels with thinner bezels to reduce the width of the phone to its minimum. Unfortunately, that's not the case with the Droid Turbo 2 - with its width of 78.4mm it is a slightly but noticeable wider than even the LG G4 that comes with an even larger, 5.5" display. But not water resistant, so you are not supposed to go swimming with it. It should still be safe when gets splashed with water, so you can have a peace of mind when it's raining, all of that comes thanks to the nano coating on the phone. PMA and Qi wireless charging are both supported on the Motorola Droid Turbo 2 and that's a great convenience for those times when you are just too lazy to go look for that cable. Plus, it is just convenient to have a wireless charger near the bedside. Do keep in mind that you need to buy a wireless charger separately, it's not included in the box. We've seen high-end phones with three microphones and we've even seen some Lumia phones with four mics, but this is the first time that we see a whopping five microphones put to use for noise cancellation. This sets a high bar when it comes to expectations - we still have to test the sound recording and call quality to tell whether Motorola breaks new grounds here in terms of actual sound quality. Luckily, the world of Android is finally and surely moving away from the 16GB storage tier in its base models: the Droid Turbo 2 starts at 32 gigs for the base model, and there is a 64GB version as well, perfect for power users. It's not just the adequate storage options, but the fact that you can further expand on that storage via microSD cards that makes the Droid Turbo 2 all the more attractive. With microSD cards of 200GB already on sale, you can expand the built-in storage significantly in case you really need to. The phone uses the large, 1/2.4" Sony IMX 230 sensor with phase detection auto-focus for rapid focusing and it uses an f/2.0 lens that lets more light in. The 5-megapixel front shooter comes with a wide-angle lens and large, 1.4um pixels for better low-light performance. Everyone likes different materials on a phone and that's where choice is more than welcome. You get lots of choice with the Droid Turbo 2 as it comes with three options for its back cover: one with a soft grip material, another with ballistic nylon and a third one using leather. You can select one of three bases we mentioned earlier and then, you can go into Moto Maker and customize the color and other accent details to make the Droid Turbo 2 more personal and reflecting your personality. and only for a specific carrier suscribers... But may get one and unlock it, then use it anywhere else, like my elder bro's DROID Razr. woah that legend! How does number 5: "Wider than your average phone" count as a feature, even price is not a feature. Don't forget the unbalanced-looking Verizon checkmark at the bottom! Innovation! I think this is a decent phone. Lots of complaint here, but I like it. People complain that the Galaxy phones did away with the sd slot for aesthetics now they complaint that this phone is ugly. lol. Fail. Here's why. Moto display QUALITY are subpar. Have been for a while. 810 Processor version 1,2,3,4,...doesn't matter. All have heat issues. RAM speed and management are average. Battery life. For the size of the battery you would think it'll be able to take down the S6 Active, we'll see. All in all Moto call quality is about the only thing is it excels at. Have to agree. Another phone will be doomed by 810, I'm sure that with better chip, from Intel or Sammy it would get even better battery life. 2 days with 3700 mah is nothing to be proud of, Z3 could do it with 3000 mah. 810 is total disaster and it made this year one big flop in Android industry. I love the design though, but I have to say: Another day, another phablet. How cool is THAT? It'll probably have worse battery life than its predecessor because of the 810 eating it's juice up. Of course it comes with "Flagship Price" seeing how it is the next Droid "Flagship" device. I'm sure there's still a contingent of loyal Droid users, but anectodally, I've seen many move on to Samsung or even iPhone. It was a great brand from 2009-2010, but now it's more of a VZW niche product. I got one for the attention the line gets from Verizon, but moreso for the mostly stock Moto software. If the Moto X had a bigger battery and more storage, I would have gotten that instead. I like Motorola's direction with the phones. I don't think width was the right choice to sacrifice for battery capacity. Keep the battery capacity and expand height...like how anker does it. Also, the screen of the the moto pure is excellent, hopefully they've included the same quality and not that of the nexus 6. Hopefully the OS stays clean from a software standpoint. All manufacturer's have been busted with qualcomm's mistakes - it would have been better for qualcomm to create a faster series 32 bit chip for 2015 to create time for a custom 64 bit chip for 2016. Another great innovation by Android manufacturer Motorola. Recall Motorola had first ever fingerprint sensor on smart phone in their flagship phone Atrix in 2011 (2 years before Apple iphone). So Motorola is great leader at innovation - not so great at keeping the features around though. Hope other Android manufacturers pickup shatter proof screens soon. What I am wondering is what is the max speed of a SD card can the turbo 2 handle? I mean can I use uhs-1 or uhs-2?